Upper Canada was a Province created by the influx of immigrants, from the first loyalists who arrived during and after the American Revolution. But they were not the only group who would make Upper Canada home. As the Province grew, many different groups such as Germans, English, Irish, Scottish, Americans, French, and those who came as slaves, arrived owing to the rich cultural mix that we in Ontario still enjoy today. And many of these cultures owe their presence in the country to these early pioneers who often faced harsh conditions to carve a living out of the wilderness that made up of most of Upper Canada throughout the early decades of its existence. Many in the government felt that Upper Canada was becoming far too multi-cultural. They desired Upper Canada to reflect England, those who shared their loyalty to the crown and the ideals of loyalty. Men like Reverand John Strachan wanted to see all to be Anglican and would make use of the Clergy Reserve to stop the spread of non-Anglican churches specifically Roman Catholics, which went hand-in-hand with the Irish or French-Canadians. But in the late 18th and early 19th Centuries, the government had no far-reaching agency; the wilderness was wild and open to any who could make a life for themselves. 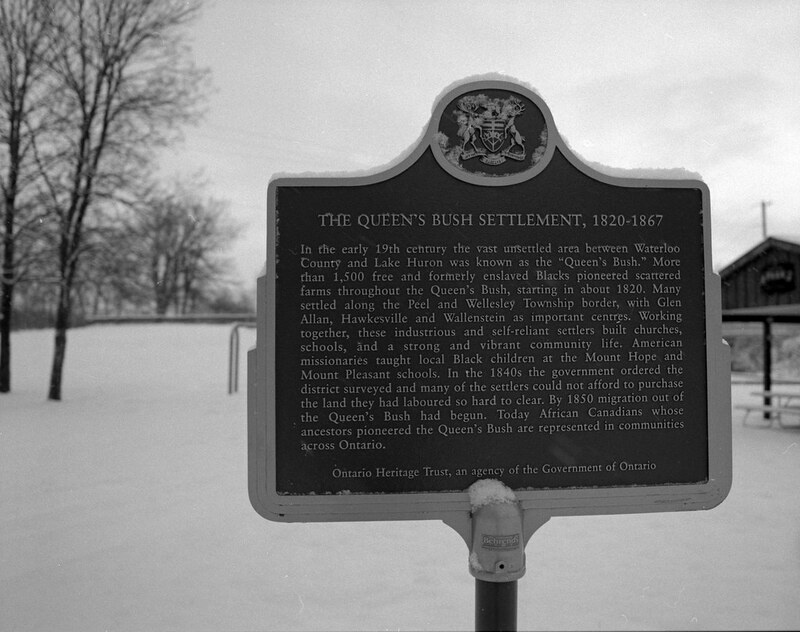 A Historical Plaque marking the Queen’s Bush Settlements, located in Glen Allan, Ontario one of many settlements that grew out of the original pioneers who arrived in the area. One of the oldest settlements that became home to a large community of former slaves, those who received their freedom by arriving in Upper Canada after the signing of the Act to Reduce Slavery in 1796 is the Queen’s Bush. Rather than live in poor shanty communities on the outskirts of the urban centres of Upper Canada or stay within easy reach of the border. Many of these black families decided to head north. They weren’t the first to carve a life out of the wilderness in the Queen’s Bush. In 1795 Mennonites arrived and established some of the first communities in the area. By 1800 the black pioneers arrived and headed even further north into the rich forests of the region. The Mennonites were happy to help, often providing supplies and showing them trails through the woods. Little existed north of these first communities of Brantford, Preston (Cambridge), and Berlin (Kitchener). And these pioneers travelled by foot mostly, by animal and wagon if they had them. Those who made the trek carved out farms, lived off game and fish. Felled trees, built shelters. Some just lived in natural caves or dugouts from the hills before building cabins and homes. Rivers provided water and power for the mills that followed to cut timber into lumber and grind wheat into flour. 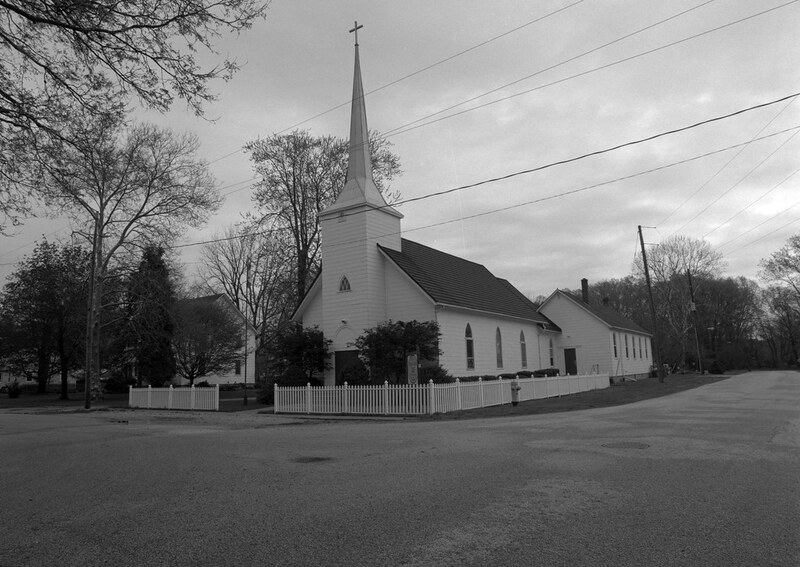 Churches, Schools, and communities grew up. And by the 1820s a thriving population existed in the area. A Statue to John Galt in downtown Guelph. 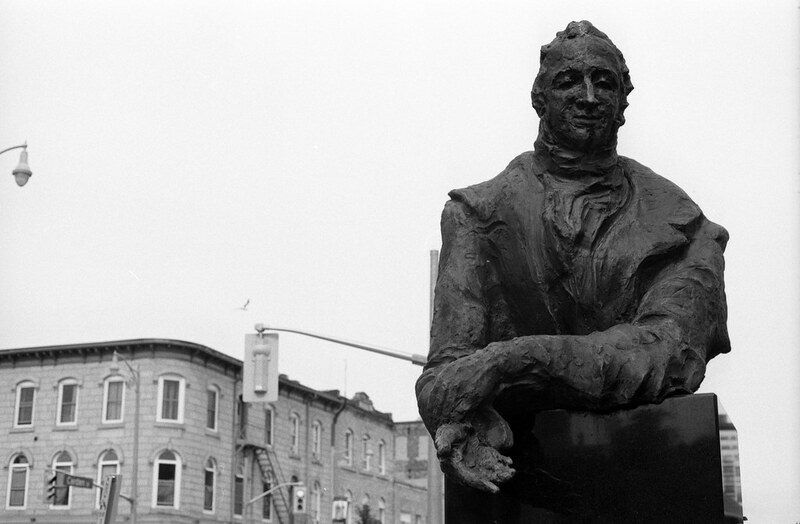 Galt is celebrated as the city’s founder. 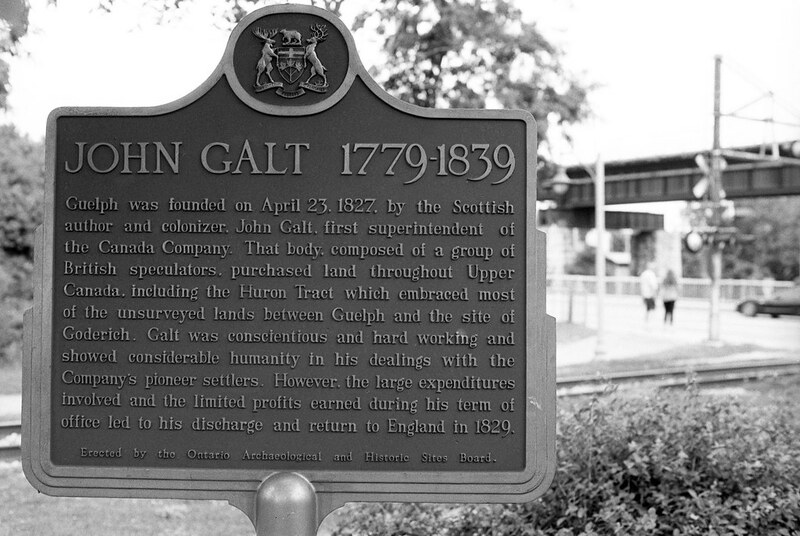 A Historical Plaque commemorating John Galt’s contribution to the colonization of Upper Canada stands by the Speed River in Guelph one of two towns Galt helped found. Not all settlement in the post-war boom would be self-directed. Some came in an orderly and organised fashion. Robert Gourlay’s paper on land use in Upper Canada caught the attention of those in power in England. It soon became public knowledge that the Crown desired to offload much of its colonial holdings, that is Crown Land. The plan caught the attention of John Galt. Galt, born the 2nd of May 1779, and had a successful career as an author when he approached Parliament for a charter to form the Canada Company in 1824. The Canada Company, established by Royal Charter (like the Hudson Bay Company) to execute an orderly colonisation of several tracts of Crown Land in Upper Canada. The company had raised enough capital to purchase vast amounts of Crown Land and planned to purchase the clergy reserve also from the Anglican Church. When John Strachan learned of the purchase of the clergy reserve, he immediately decried the move. The protest was taken up by other members of the Family Compact. It worked, keeping the Clergy Reserve in the hands of Strachan. Instead, the Executive Council offered up a large parcel of land recently acquired by the government. The Huron Tract purchased under Crown Treaty 29; the land had been the traditional summer grounds for the Huron, Algonquin and Ojibwa civilisations. The Canada Company did far more than purchase land; the charter called for them to build roads, bridges, and schools. They arranged for families to purchase land and arranged passage on ships. They provided tools with which they could build homes. Galt had a grander vision, he wanted to establish proper towns, and on the 23rd of April 1827 in a grand ceremony with a cutting down of a tree Guelph was founded. Guelph became the centre point for the activities of the Canada Company. Galt laid out the town in a radial fashion with streets extended out like spokes from a central square; he also built a small office to act as the company’s headquarters. Agents from the company began to carve a proper colonisation road west into the Huron Tract, known as the Huron Road. 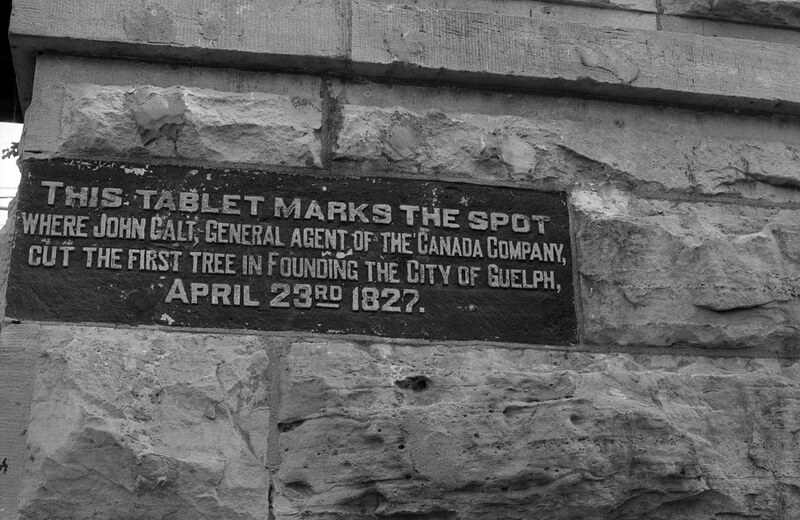 A stone marker at Macdonell and Woolwhich in downtown Guelph marking the site of the founding of Guelph. 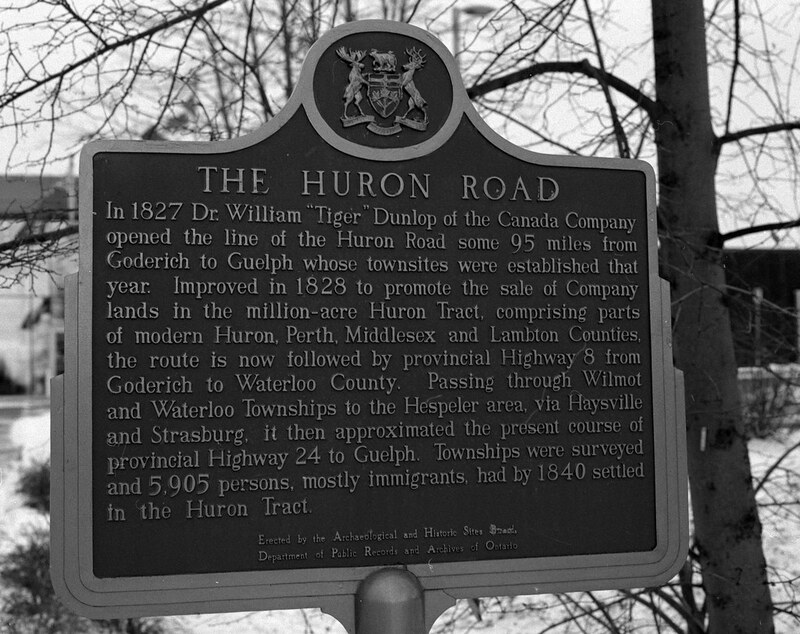 A historical plaque marks a section of the old Huron Road located at the Waterloo Museum in Kitchener, Ontario. Not all within the government were pleased with the Canada Company. Among them, William Lyon MacKenzie who made a point to call out the company for not following through to build the improvements promised. He also went after the Executive Council for pocketing the money from the sale of the Huron Tract and not using the proceeded to improve the existing infrastructure in the Province and to meddle in the affairs of the company. The Canada Company was bringing in more than just English settlers, anyone who could afford the price of land could find a new home in Upper Canada. And the more non-English in the mix, the richer the ground for spreading the message of Reform. The company would go on to found its second town, Goderich in 1828. The town marked the end of the Huron Road. Many families would found their small communities along the length of the road, among them Anthony Van Egmond, a former cavalry officer of Dutch descent who had served in the French Army during the Napoleonic Wars. But Galt had by this point run afoul of the Government, specifically Lieutenant-Governor Sir Peregrine Maitland. They accused Galt of lacking basic accounting skills and general mismanagement of the company. Galt left the company in 1829, and with the help of Maitland, the Family Compact ensured one of their allies, William Allan installed at the new head. 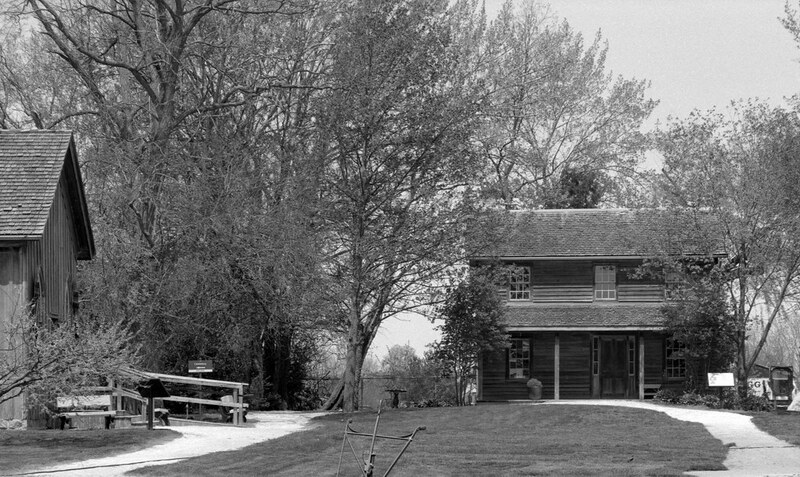 The Van Egmond House was built by Anthony Van Egmond when he emmigrated to Canada, today it is a living history museum of the early settlers on the Huron Tract. A plaque dedicated to the early pioneers of the Huron Tract was errected in 1928 at the 100th anniversary of the founding of Goderich. By the 1830s the colonial expansion in Upper Canada was in full swing. Guelph, Goderich, and the communities of the Queen’s Bush were thriving and growing. But not all who came to Canada seeking freedom desired to live their lives. Some desired to improve the lot of their fellow humans, and teach them greater skills beyond farming and other labourers. Josiah Henson arrived in Fort Erie in 1832. Born into slavery, Henson suffered severe physical abuse during his time as a slave, but never once lashed out in revenge. Instead, he served his master humbly, a lifestyle he credits to his upbringing in the Christian faith. His master would trust Henson enough to send him unaccompanied on business, one on such trip to Kentucky, escorting fellow slaves as payment to a man whom Henson’s master owed money. It was in Kentucky that Henson would attend a Methodist rally and he studied under several Methodist Ministers and he was ordained as a minister in the Methodist Church. He approached his master and asked to buy his freedom and that of his family, his master, agreed. But when Henson had earned money, he changed the price. Having been cheated, Henson arranged for him and his family to escape. Henson worked hard, preaching where he could and working as a farm hand earning enough to move to Colchester. Colchester is one of several communities in Western Upper Canada that had a large population of former slaves. The same year, 1834, the British Empire ended slavery across the Empire among blacks. It was here he started planning a community solely for former slaves and a school to train them in skills beyond agriculture. While in Colchester he met two other abolitionists, Hiram Wilson and James Fuller. Together the three men chartered the British-American School and purchased a large tract of land. 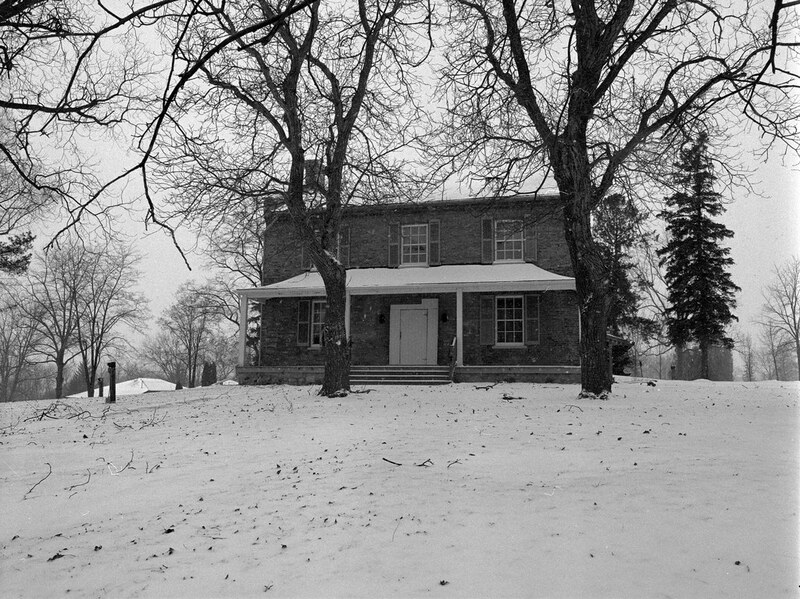 Henson felt loyalty to his new home and became a leader in the community even raising an all-black militia unit that served during the Upper Canada Rebellion With Henson purchasing land adjacent to the land for their planned town, although it wouldn’t be until 1841 that they founded Dawn and the British American School. The community thrived, it’s sawmills produced lumber of a quality not seen before. Thanks to the rich black walnut in the region. Henson would build a cabin and a church of his own and preached from the pulpit every Sunday. Historic Christ Church in Colchester, Ontario. The Church was the centre of worship for many in the community and many former slaves were laid to rest in its graveyard. Josiah Henson’s home today at Uncle Tom’s Cabin Historic Site in Dresden, Ontario. As the 1840s continues, the Canadian Government sent surveyors into the Queen’s Bush, and many of the early settlers forced out of their homes and land unable to afford the cost to purchase the land they carved they’re out a life. Many would go on to settle in Dawn and other communities through the region. White settlers would build communities around the ones created by those early Black settlers. Some would offer parcels of land to many early settlers to continue to live. By the 1850s the western reaches were populated, and the arrival of the railroad only added to the population. At Dawn, Henson would be visited by Harriet Beecher Stowe, who used his story as inspiration for her anti-slavery novel, Uncle Tom’s Cabin. But the American Civil War and the Emancipation Proclamation sent many former slaves back to the United States, and Dawn would take the name Dresden in 1873. Henson would remain in Canada until his death in 1883. Goderich and Guelph would develop into major urban centres in the Province of Canada and Ontario through the remainder of the 19th-Century. The Canada Company continued to operate well into the 20th-Century. The final parcel of land would be sold to the Province of Ontario in 1951 to become the core of the Pinery Provincial Park and would vote to dissolve in 1953. The community of Hawksville can trace it’s roots to the early black settlers of the Queen’s Bush and remains a small village today. 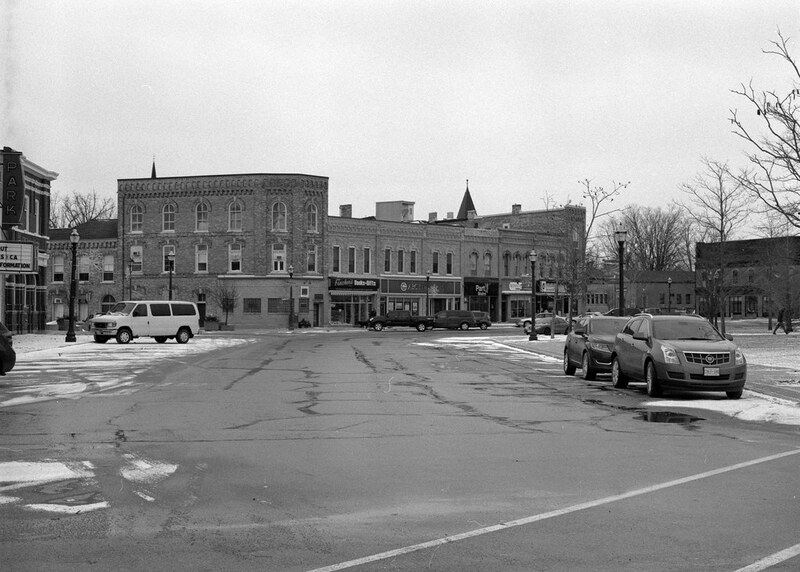 Downtown Goderich today remains centred around the original square first laid out according to the plans of John Galt and executed by William “Tiger” Dunlop. Today the population of Ontario is richer because of the vast racial diversity of the early settlers. Many communities trace their heritage to the efforts of the Mennonites, Early Black Pioneers, and the corporate colonisation efforts of the Canada Company. A historical plaque in Glen Allan, Ontario celebrates the early black pioneers, and several small villages in the area like Glen Allan, Hawkesville, and Wallenstein can trace their founding to these early pioneers. Cities like Goderich and Guelph remain major urban centres. 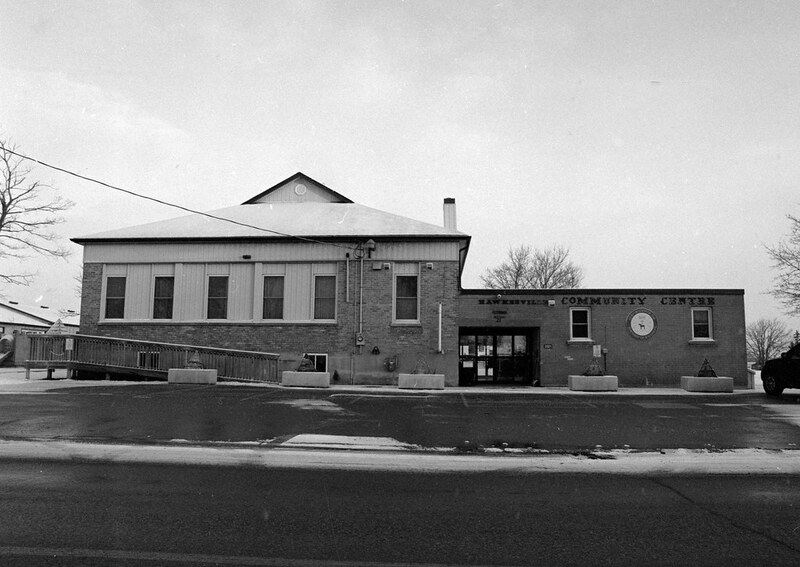 The River Run Centre in Guelph sits on the approximate site of the Canada Company Headquarters on the Speed River which was used well into the 20th-Century as a railroad station. A statue and plaque to John Galt is in downtown Guelph as well as a marker to the founding of the city is within the Downtown near the old City Hall. The Huron Road today no longer exists in its original form, but Highway 24, 7, and 8 follow the rough route of the colonisation road. A plaque dedicated to the road can be found at the Waterloo Regional Museum in Kitchener, Ontario. 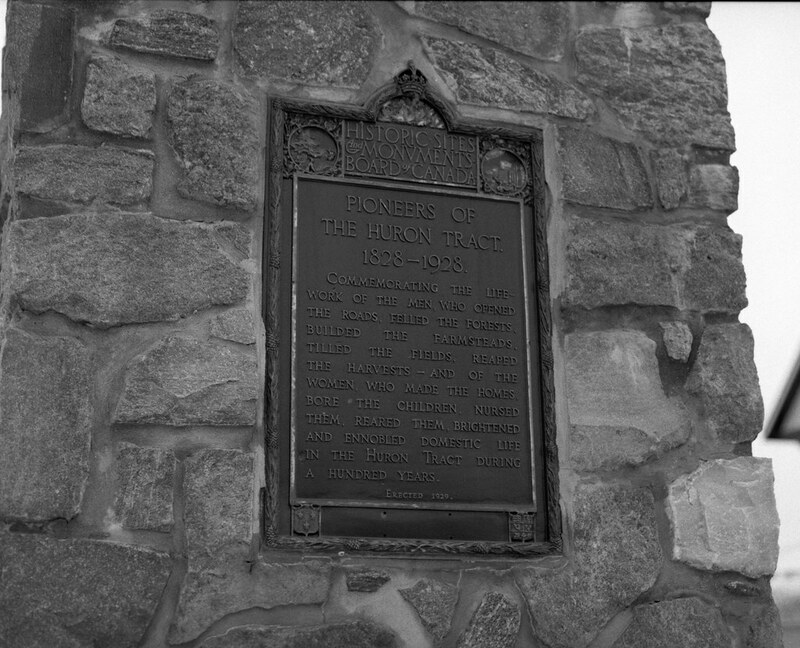 A second plaque to the Huron Pioneers is found on Highway 8 before entering downtown Goderich. The Anthony Van Egmond House can be visited just south of Highway 8 in Egmondville; he is buried nearby in the community’s cemetery. Uncle Tom’s Cabin Historic Site is operated by the Ontario Heritage Trust just outside modern Dresden, where you can visit the original home of Josiah Henson and his church. Dresden is also proud of their heritage and has several plaques and trails to explore the rich history of the black community that once thrived in the region. And the Pinery Provincial Park provides amazing camping and views of Ontario’s West Coast, and I have camped at the site a while back with my father, brother, and late grandfather.